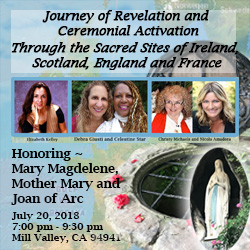 Come and receive the dynamic information and spiritual transmissions from those who have journeyed on the sacred pilgrimage to the sacred sites of Ireland, Scotland, and southern France, hosted by Celestine Star and Debra Giusti, with guest speakers Christy Michaels, Nichola Amadora, and Elizabeth Kelly. This presentation will be honoring Mary Magdalene, “Keeper of the Ancient Ministries”, Mother Mary, “Emanation of the Immaculate Conception”, and Joan of Arc, “Beholder of the Banner of Truth and Freedom”. Debra and Celestine will share a dynamic photo presentation and personal and metaphysical details of their recent spiritual pilgrimage to southern France, which will also include Celestine’s trip to the sacred sites of Ireland, Scotland, and England. This includes ceremonies performed at sacred sites where 43 crystals planted in the grid, including the last one which was at the top of the Eiffel Tower in France! Christy, Nicola and Elizabeth are all passionate travelers to southern France to the sacred sites of Mary Magdalene and mother Mary. And they have all experienced divine feminine realizations and spiritual personal activations on their journeys, which will they will also share during this dynamic evening. At the end of the evening there will be an opportunity for you to personally dive deep and received the “Benedict initiation”, and participate in the 44th “Crystalline Grid Ceremony”, which will take place at the end of the evening. This will truly be unique evening that will be deeply educational and spiritually up leveling.